Looking for a way to add a splash of adorable vibe to your hairstyle? Think pixie with a choppy fringe or a bowl bob! 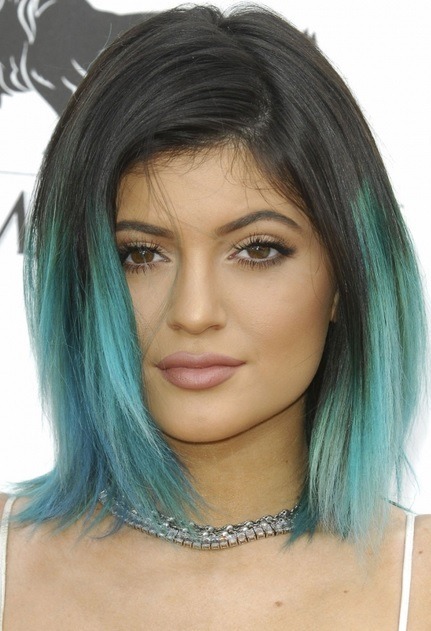 Take a peek at these cute hairstyles before you go to your next haircut appointment! French journalist Celine Bosquet can be totally proud of her glossy and silky ma.. Apply very small amount of hair cream on dump hair. Add some anti frizz serum too. Create center parting and blow dry your hair section by section with medium size round brush. When you finish blow drying, create deep side parting. This should do perfect for volume on the crown. Zoe Saldana arrived at Met Ball 2014 wearing her long, brown hair styled in this..
Zoe Saldana arrived at Met Ball 2014 wearing her long, brown hair styled in this elegant updo. When it comes to updo, convenient trick for round and heart shaped face is amplifying volume on the crown by teasing hair at this section, which can visually elongate this face type. Bangs are middle parted and they are softly embracing sides of Zoe’s face. Combination of two of our favorite hairstyle factors: absolutely adorable and simp.. Combination of two of our favorite hairstyle factors: absolutely adorable and simple to repeat! Jennifer Lawrence appeared at Cannes Film Festival 2014 wearing her multicolored blond hair tied in this cute pony tail. Loose, messy waves are achieved by blow drying her hair and curling it into beach waves with iron. Bangs are side swept and loose, while rest of her hair is collected at her nape and tied into low pony tail. Short hair is pretty much refreshing experience on the red carpet, as we don’t get..
Short hair is pretty much refreshing experience on the red carpet, as we don’t get to see it too often. 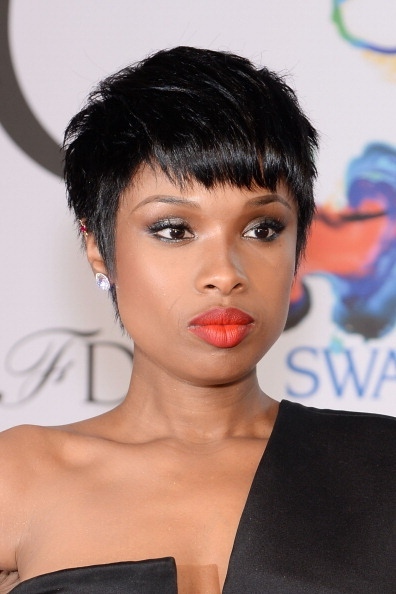 Jennifer Hudson’s jet black hair is cut in choppy pixie hairstyle which is framing her face with silky wisps. You need a complete and fundamental style transformation? This is definitely a style which could bring great deal of attention to your facial features, so consider it next time you visit your hair dresser. Are you in need for something adorable for your bob style? Opt for cuteness of loo..
Are you in need for something adorable for your bob style? Opt for cuteness of loose, soft curls and side parting and you wont regret it. Rosario Dawson appeared wearing this hairstyle at NCLR ALMA Awards 2013. You can create the same style quite well by using hot rollers and shining serum. Worried about how much hair it takes to make that fishtail braid and still have th.. Worried about how much hair it takes to make that fishtail braid and still have that wild, curly mane all voluminous and cool on the side? Worry not, no need to renounce those extra few locks of volume. All you need is faux braid hair extension to clip it at your nape and cover with rest of your hair. Nicole Scherzinger proudly promoted her brand new style at the streets of London this summer. Sunkissed hair looks so good on her, don’t you think? Joan Smalls was wearing her long, brown mane loose and wavy at CFDA fashion A..
Beach waves look like perfectly balanced hybrid of neat waves and out of the bed..
Beach waves look like perfectly balanced hybrid of neat waves and out of the bed look. Glamour of Jessica Alba’s hairstyle appears so effortless and natural, making us think she actually looks as stunning even when she wakes up. We have to admit that nothing compares to golden highlights when Jess needs to look radiant and girly. Ombre adds the volume to this gorgeous hairstyle. Lily Cole’s face definitely looks like enlivened portrait of a lady from rococo tim..
Lily Cole’s face definitely looks like enlivened portrait of a lady from rococo times. 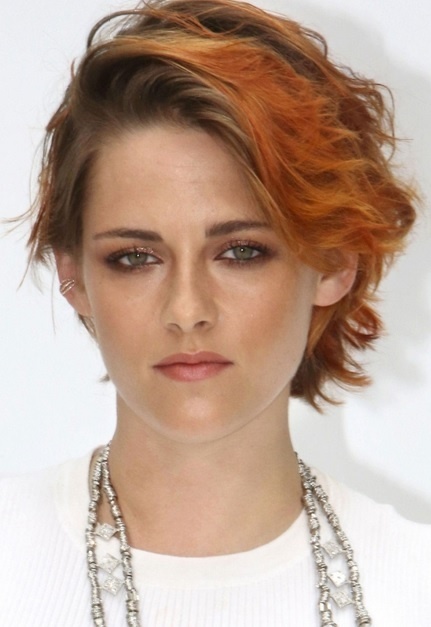 This impression is even more amplified with her red hair color and wavy hair texture. It takes not more than 3 min to copy this style if your hair is naturaly wavy. Just pick your hair up all the way to the crown, wrap it into loose, messy topknot, secure with bobby pins and let a few wisps to hang from it. Straighthaired ladies, sorry. You will just have to spend some extra time with curling iron or diffuser while blow drying your hair to get these sweet waves. Attention ladies! We have coolness overload right here. Out-of-bed look is all abo.. Attention ladies! We have coolness overload right here. Out-of-bed look is all about being drop dead gorgeous with I-don’t-care attitude. Poppy’s straight, long, blond hair is cut in soft layers, which is recommendable starting point for this hairstyle. Wanna try it on? Apply some volumizing mousse on your dump hair, bend down and flip your tresses over, direct the air flow of your blow dryer to the roots (intentional frizz is part of this style) and gently crumple your hair from ends to roots until it is completely dry. Avoid overdoing your style, so use only fingers to set your locks to the place. Part your hair in the middle, take one 2” section closest to your face and make a loose braid. Voilà! Long, cascading, natural look waves of luscious hair is trademark of Gisele Bundc..
, so DIY is very much an option with extra pair of hands for back of your head and nape.